Sara Yang, Clinical Team Leader, Novotech; Nadya Yang, Country Manager, Novotech; Prof. Chung Y. Hsu, Sr. CRA, CMUH; Hedy Liu, CMU Alumnus; Bee-Jing Yang, Manager, CMUH. 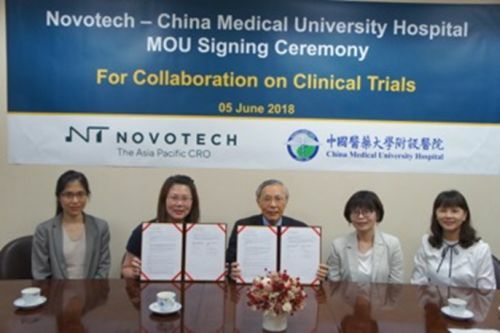 SYDNEY, Jun 15, 2018 - (ACN Newswire) - The Asia-Pacific CRO Novotech has signed an MoU with China Medical University Hospital (CMUH) Taiwan to facilitate high-quality and rapid feasibility, start-up and recruitment processes. CMUH is a 2,054-bed facility with a dedicated Clinical Trials Centre (CTC). www.cmuh.cmu.edu.tw. -- Outstanding recruiters across many therapeutic areas: breast cancer, lung cancer, colorectal cancer, Hepatitis, SLE, RA, Stroke, Diabetes, etc. Under the terms of the MoU, CMUH will provide professional and medical clinical trial advice to the Novotech team including feasibility, principal investigator selection, and assistance with patient recruitment. Novotech will promote the clinical research capabilities of CMUH internationally, in particular their Phase 1 unit. CMUH-CTC was established in 2008 and has been led by distinguished Professor Chung Y. Hsu since 2010. According to the CTC, Professor Hsu's management principle is to deliver international standard clinical research to facilitate market approval of new drugs and devices for domestic and global pharmaceutical companies. In 2016, CMUH-CTC joined the "International Clinical Trials Center Network" (ICN) which includes Zurich University, Suisse, Harvard University, US, Cambridge University, UK and HK University. Clinical trials in Taiwan are regulated by the Taiwan FDA, Ministry of Health and Welfare, who establish and enforce compliance with ICH-GCP standards. Dr. Yooni Kim, Novotech Executive Director, Asian Operations, said "Taiwan with a population of 23.3 million has a world-class medical system and is well established as a premier clinical research location with a rich diversity of patient ethnic groups. The MOU means Novotech will also have dedicated clinical experts within CMUH to support and prioritise rapid clinical processes for Novotech biopharma clients. "Novotech is The Asia-Pacific CRO, so is committed to establishing ongoing engagement with leading medical institutions in each country across the Asia-Pacific region. We have offices and teams on the ground as well as MoUs and long-term relationships with major hospitals that directly benefit our clients. "Our in-country relationships enable a more comprehensive understanding of local regulatory changes, access to leading PIs, strong site connections, and productive patient populations to deliver success for our clients within timelines and budgets," said Dr. Kim. Novotech is the Asia-Pacific specialist contract research organization (CRO) established in 1996, headquartered in Australia with offices in 11 countries across the region, and 5 MOUs with major health providers. See the latest data on Asia clinical trials here: www.novotech-cro.com/resources. Headquartered in Sydney, Novotech Pty Ltd is internationally recognised as the leading regional full-service contract research organisation (CRO). With a focus on clinical monitoring, Novotech has been instrumental in the success of hundreds of Phase I - IV clinical trials in the Asia-Pacific region, where it's strong presence includes running clinical trials in all key regional markets. Novotech also has worldwide reach through its network of global strategic partners.